When we think of turning over a new leaf, we think essentially of making a change, right? It’s about flipping the page of a book – turning a new leaf to a blank page where we can write our new story… and we think we can be something or someone new. What we forget is that we’re still writing in the same book… it’s the same story that we’re continuing. Maybe we take it in a new direction, but it’s still the same story. So then turning over a new leaf might be about looking at things differently. Like a leaf – when we turn it over, it’s still a leaf, right? But now we see it differently. Now so far, this sounds like a typical new year’s sermon – make resolutions, make a change, etc. I was planning to talk about how we use New Year’s as a chance to make a new start – along with other chances the calendar provides: the Chinese new year, and the first day of spring, then the first day of school, then the holidays, and suddenly we’re back to the New year and we might not have actually made a new start, a new habit, a new change. It’s a fairly typical topic, this time of year. How can we turn over a new leaf as individuals, as a congregation? And to be honest, until about 9am Thursday, this is exactly where the sermon was headed. That is when my colleague, Rev. Ian Riddell, turned over the leaf we call the seven principles. If you turn about eight pages into one of our hymnals, you’ll see them: Our organizing statements of who we are and what we believe. Nicely laid out, in a list. We even tend to number them, and quote them by number – our second principle calls me to protest war, I’m doing third principle work in learning about Hinduism, I’m a seventh principle guy so I sometimes do church in the woods. A nice, handy, step by step list. Heck, you could even do a seven step program, isolating each principle and focusing on them one at a time. Nice. Neat. Ordered. Isolated. Each principle, an individual. Instead of an ordered list, it’s a circle…no numbered principles, but rather a different pattern of organization. A circle. A wheel. As you can see, I hope, the center – the axle – is the inherent worth and dignity of every person. It’s where we start, where everything else moves from, all at once. Then encompassing it all is the interdependent web of which we are all a part. And the spokes are the other principles, the ways we understand ourselves in the world, the ways we act in the world because of who we are and where we are. So what does this mean? How would we approach our faith, our work, our sense of the divine differently, if we turn over a new leaf in our big book of Unitarian Universalism and look at it this way? Let start with the section calling us to affirm and promote justice, equity, and compassion in human relations. Alone, it sounds pretty good; it’s the cornerstone of the Unitarian Universalist Service Committee, of Standing on the Side of Love, and of every social justice action we take, both within and outside Unitarian Universalism. Those things all sound good, are all preached by the major religions, and who doesn’t want justice, equity, and compassion? As a bullet on the principles list, it’s positive and a bit of an ‘of course’. You see, Unitarian Universalists are so good at questioning things, but often we forget to question what’s underneath our own principles. They’re written on the page – literally – and so they are there, set in stone as it were. Often we ask ‘What’ – what do they mean, or ‘How’ – how do we affirm and promote them. But rarely do we ask ‘Why’ – why are they important for us to affirm and promote. Turning the page and seeing them in this new way, suddenly we have a way to question our principles, to interrogate the deeper meanings, to see the connection between the individual and the world. Why is justice, equity, and compassion so important? Because if I as an individual am inherently worthy of dignity, then so must every other individual. And if we are all connected, how can I stand like the pigs in Orwell’s Animal Farm and say some animals are more equal than others? How can I not see that the compassion I hope you’ll show me might be worth showing to someone – everyone – else? This principle calls us to be in that state of becoming just, equitable, compassionate – we are never just just, but if we remember who we are and where we come from, we are becoming just. The justice, equity, and compassion we get from the world and see in the world helps us become more just – to others, but also to ourselves. Now I will admit something here – a bit of my own theological struggle. I don’t always believe the things I know are true also apply to me. In other words, sometimes it is easier to declare that the inherent worth and dignity of every person in this interdependent web of all existence means that there must be justice, equity, and compassion for others… but it’s hard to accept for myself that I am part of that web and am as inherently worthy so that justice, equity, and compassion should also be for me. For you, absolutely. For everyone in the world who faces injustice, oppression, and hatred, absolutely. And when the principles are in a tidy little list, it’s easy to dismiss myself as not really part of it. It’s easy to apply these things to the people I love, the congregation I serve, the larger community. But this wheel…Ian’s pesky new way of looking at things… well, it’s not letting me off the hook. Instead, it is reminding me of what David Bumbaugh wrote: “In this interconnected existence the well-being of one cannot be separated from the well-being of the whole, that ultimately we all spring from the same source and all journey to the same ultimate destiny.” In other words, y’all can’t grow into harmony with the Divine without me, nor I without y’all, nor all of us without each other. We aren’t isolated – while Paul Simon’s line “I am a rock, I am an island” is more singable, John Donne’s poetic “no man is an island” is actually much more accurate. We are not islands. We are all part of what James Luther Adams called the brotherhood of man, but which I prefer to call the family of humanity. It’s the table blessing that calls us to be thankful for the many hands make a meal possible – the farmers who grew it, the workers who picked it and packed it, the truckers who transported it, the grocers and stock boys and cashiers who sold it, the cooks who prepared it. Our food comes from all over the country, all over the world. We cannot know for sure where the orange I have in my hands has been, who has handled it. So how can I not want to affirm and promote a world community, when that world community feeds me? And that’s just one example. When we see ourselves as both an individual and part of something bigger, we begin to see others the same way. And that’s not always easy. Sometimes we get too self-focused and see every act, every word, every decision just about ourselves. Or we get too outwardly focused and feel lost and used and burned out. This new leaf – a new perspective on a familiar story – reminds we are both-and. So we can see how many of these might work. But how might we understand some of the more individualistic principles, like encouragement to spiritual growth? That seems awfully individualistic. And on one hand, it is. My spiritual path is not your spiritual path. As we like to say, we need not think alike to love alike. In this room, I suspect we have Buddhists and Christians and atheists and pagans and who knows what else? But even this principle – a vital one to be sure – both benefits from the going in and the coming out and strengthens both. It is your path; but this religious community – this congregation – encourages you to this path. The path you choose is modeled by others out there – those who have gone before, those who are going along it now. Their wisdom informs yours. And here’s a secret: your wisdom informs theirs too. And so on. 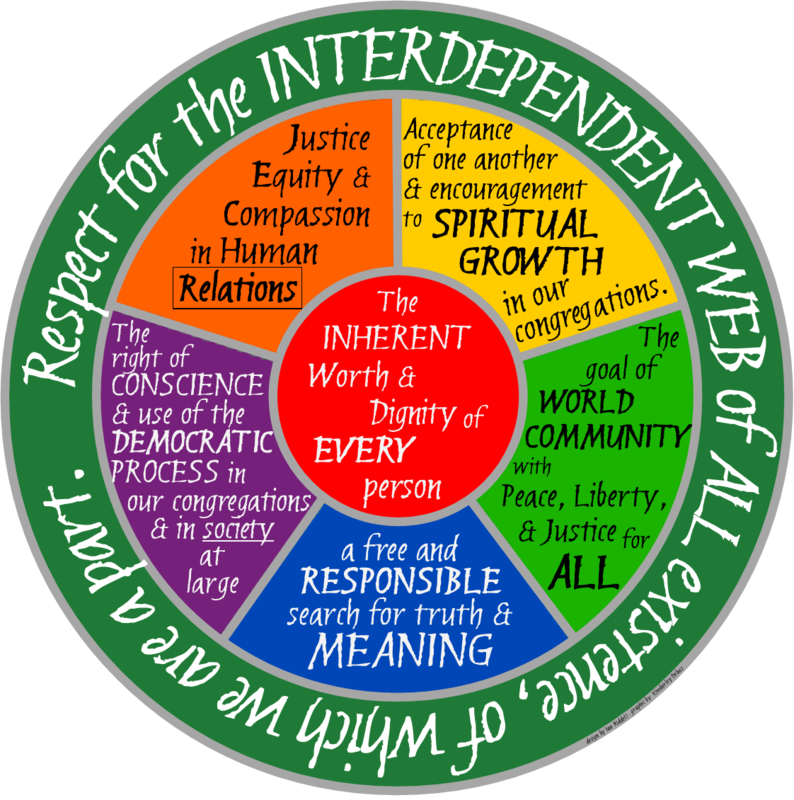 Each principle, connecting the self to the interdependent web and back again, in areas of truth, justice, community, connection, process, growth, and compassion. Leading us from the familiar page that says “what” and to the next page which asks “why”. Once you see it, it can’t be unseen. Now we can’t think of the principles without thinking about the wheel and the spokes and the interconnectedness. We have transformed our way of thinking about it… we’ve turned over a new leaf. And maybe that’s the real New Year’s message – not that we become something new overnight, but that we – and our world – and how we act in it – is deeply and inexorably interconnected, interdependent. And that’s not just about how we act outside these walls but how we act inside them too – how we are with each other. Some of us can be too inwardly focused, or outwardly focused, and we forget the gifts of both receiving and giving love, compassion, energy, encouragement. That’s the change we can make – to remember and act on our mindfulness of these connections. After a bit of silence, I will invite us to sing a simple song, found in Singing the Journey – a setting of the Buddhist meditation set to music by the guy who got us to turn over this new leaf in the first place, Rev. Ian Riddell. Huh. It really is a circle.